Virgin coconut oil is known for its various uses in food, cosmetics and nutritional supplement industries. It also helps to promote skin elasticity, anti aging, prevents skin wrinkling and is an effective moisturizer plus softener to skin. It is also beneficial to hair also. It is best for baby skin protection as it is very effective for eczema, diaper rash, itchiness, dry skin and much more. It is believed that applying or massaging with virgin coconut oil on baby skin before every bath makes the baby skin fairer. 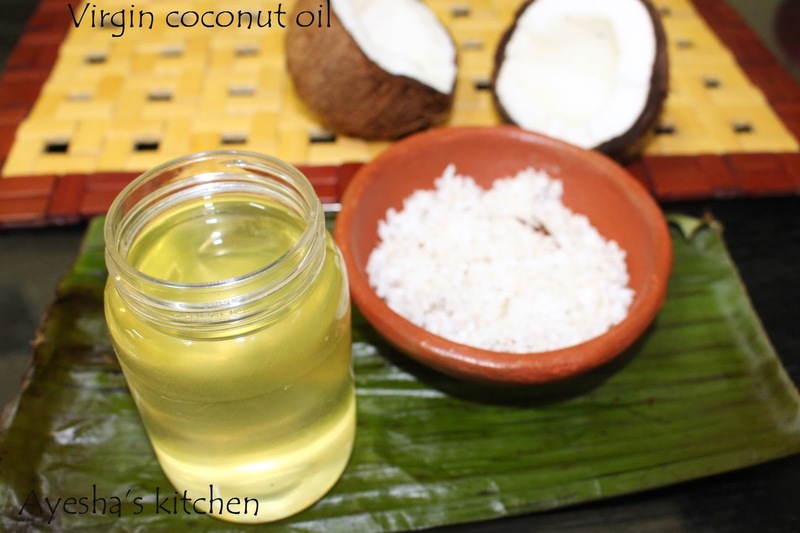 Virgin coconut oil is well known for its taste, nice fragrance, antioxidants, vitamins and much more. 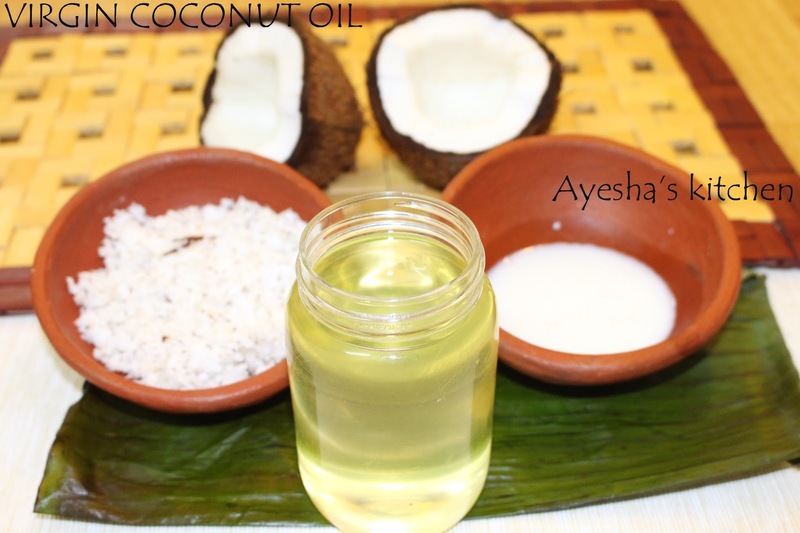 Virgin coconut oil and ordinary coconut oil has got many differences and the main difference lies in their extraction process. Ordinary coconut oil is extracted from dried coconut (copra) and the virgin coconut oil is extracted from fresh coconut milk obtained from fresh coconut. More over as virgin coconut oil is not subjected to heat ( sunlight) it is higher in vitamin content, anti oxidants ( which is nil or less in ordinary oil), minerals, taste, fragrance and even the in the amount of protein. The shelf life of virgin oil is much longer than any other edible oil. Virgin coconut oil is made from the fresh coconut flesh, ie.. grated coconut. Here chemicals and high heating are not used. The oil is extracted from fresh grated coconut by heating it with warm water, then squeezing it to take coconut milk, and then boiling coconut milk in a medium low flame to separate oil from the water. We are going to make virgin coconut oil from grated coconut by boiling method. So here i took coconut milk from three whole fresh grated coconut ( do not use dried coconut) . Do not use packed coconut milk for this recipe. I got 300 ml of virgin coconut oil from 3 whole coconut, grated. The by product of this virgin coconut oil is a very yummy sweet and can make laddoo out of that. Keep ready the grated coconut in a wok and add water up to the level of coconut. Bring it to boil for 10 minutes. Stir occasionally. ( this is to get the maximum milk from coconut flesh). Let it cool . For that i transferred it to three vessels. Once cooled, squeeze the coconut milk to another wok. When done again add 2 cups of hot water to the squeezed grated coconut and mix tightly. Again squeeze its milk and set aside. Bring to boil in a medium low flame. Do not over heat the coconut milk. Let it boil and stir occasionally. It will take 1 hour to separate oil for the water. For more ..please check the video.